The latest updates help sales reps work smarter at every stage of the funnel -- from first hello to happy to customer. Office Hours: Set your company office hours to let site visitors know when you’re available to respond and when you’re out of the office. 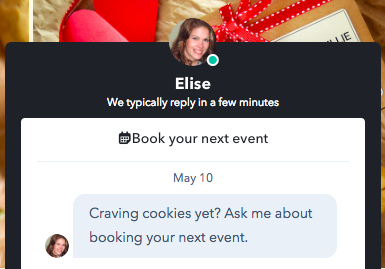 Reply Time: Use reply time to let visitors know how long it typically takes you to respond to incoming live chats. Availability Toggle: Let reps adjust their availability and allow conversations assigned to them to be automatically rerouted while they’re away. New Chat Widget Design: A new design for the chat widget gives site visitors access to easily view past conversations. Slack Integration: Get notified and respond to incoming chats directly in Slack. All of these updates to messages are now live to all HubSpot Sales Starter and HubSpot Sales Professional users. Sales reps know that effective prospecting involves sending personal, contextual emails -- not sending generic emails in bulk. Unfortunately, they don’t always have the time to do that. With the combination of sequence queues and recommendations reps can easily scale their outreach while keeping it personal, warm and friendly. As you work through the sequence queue, recommendations serves up all of the insight and info you need to optimize each email. Both sequence queues and recommendations are now available to all HubSpot Sales Professional users. Quotes is a brand new feature of HubSpot Sales Professional that lets you create beautiful, professional-looking proposals in a few quick clicks. If you’re not selling the way your buyers want to be sold, you’re leaving revenue on the table. Today, buyers want convenience -- and we predict that this trend will continue and that the fast, convenient, B2B eCommerce space will grow rapidly over the next couple of years. Quotes is just our first foray into this new B2B eCommerce space. To create a quote, look for the products section on a deal record and select Create Quote. Add a quote name, expiration date, optional comments, terms, and adjust your branding. Next, confirm the buyer information, your information, and add an optional signature requirement. Finally, you’ll be able to review products included in the quote. Here you can add discounts, adjust payment terms, and make sure all of the details are up-to-date. Once you finish creating a quote, you can easily share it via a secure, no-indexed link -- like this one! Quotes even integrates with Stripe for seamless payments. Both quotes and the Stripe integration are now available to all HubSpot Sales Professional users. With modern live chat to help you make more connections, recommendations to perfect your prospecting, and quotes to help you close more deals and less time -- you'll be well positioned to crush your quota!